Mirror photo by Shen Wu Tan Sheldon Port (right), an Alexandria native, works with construction worker Jake Muir in Tyrone. 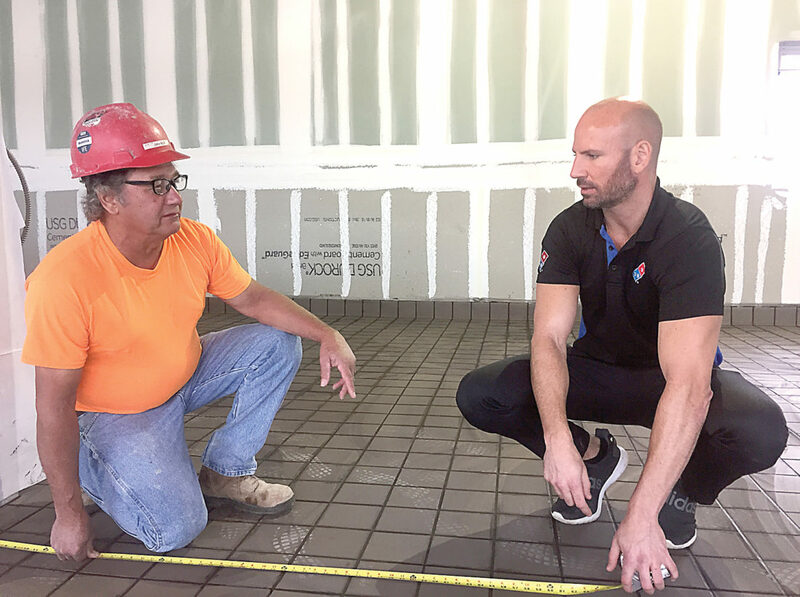 TYRONE — An Army National Guard veteran and business owner anticipates opening his fourth Domino’s Pizza in Tyrone in time for Thanksgiving, offering locals more choices for the doughy Italian-inspired dish. Sheldon Port, an Alexandria native and Juniata Valley High School graduate, visited the building of his future business, still under construction, on Nov. 2 before heading off to St. Louis to perform with his band. Grabbing a measuring tape, Port delved right in with the construction workers at the site along East Pleasant Valley Boulevard. In addition to the Tyrone location, he owns Domino’s stores in Huntingdon, Bellefonte and Duncansville. Although Port said he knew he wanted to own a Domino’s, he said it was six years in the Army National Guard that helped him become more focused and fueled his drive to be a team leader. The 37-year-old began basic training for the Army National Guard in August 1999 and was later deployed to Kosovo in 2002 for a year. Port said the Serbians were at war with the Albanians at the time and that his unit saved many from mass genocide. It was during his deployment that Port served under squad team leader, Brad Snyder, who agreed that time in the military changed the Domino’s business owner. Snyder said Port was a young soldier assigned to his unit, but that he could tell Port always wanted to do something big after his deployment. He added that Port became one of the best soldiers in the squad toward the end of the deployment. 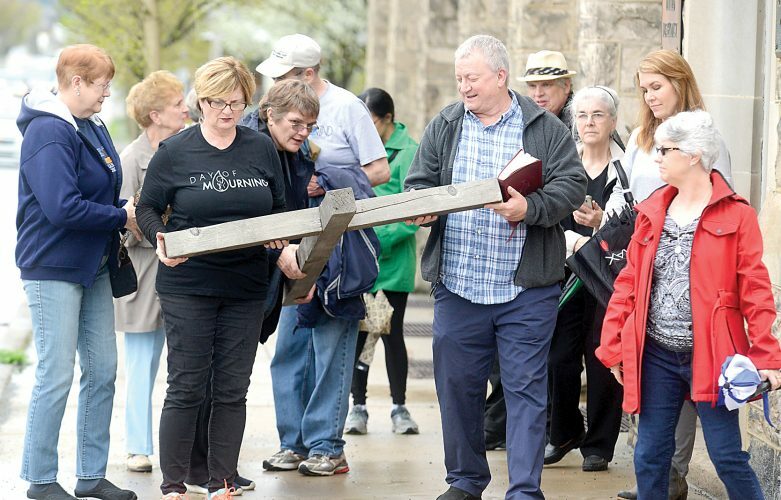 “He completely changed,” Snyder said of Port. “For a soldier that young, he was driven.” And the yearlong deployment in Kosovo gave Port more discipline in his drive, according to Snyder. Snyder said he has kept in touch with Port on and off since their deployment in the early 2000s. He described Port’s ability to run multiple pizza shops and to play with his band in Missouri as an amazing accomplishment that blows his mind. “He’s the epitome of determination and work ethic,” Bair added. Steph Hatch, Port’s store area supervisor, began working with Port in 2015 at his Domino’s in Duncansville. Owning and operating Domino’s stores helps Port pursue his music passion as a singer and guitarist. His band, Legends Undercover, plays top 40 music spanning from 1990 to 2000 and has performed at venues in Chicago, Las Vegas and other cities. Port anticipates purchasing more Domino’s stores. He stressed while Domino’s is a chain restaurant, his businesses are involved in the community and active with various local fundraising efforts. Snyder also pointed out how supportive Port is of veterans, often offering benefits and store deals for veterans and other community members. In honor of Veterans Day, Bair thanked his friend, Port, and others for their time serving their country. “I’m certainly very grateful for his service and all of our veterans’ service to this country and the sacrifice that they all made to allow us to have the freedom that we have,” he said. Although Bair said Port made sacrifices on behalf of his country, he added Port also appreciates and values what he took away from the Army National Guard. “There are a lot of people who made a lot of sacrifices,” Port said. “I just feel like what I did wasn’t as important as what a lot of people did.” He noted the Iraq War was also going on during his deployment.